How is your sales career going? What about a guy who started out as an entry-level technician for ten years at AT&T, promoted to account executive, and was the highest producer out of 1,100 salespeople. Then promoted to sales manager and received numerous sales honors and awards. His ability to manage difficult situations gained him distinction within the Bell System, and made him a frequent speaker at AT&T sales schools. 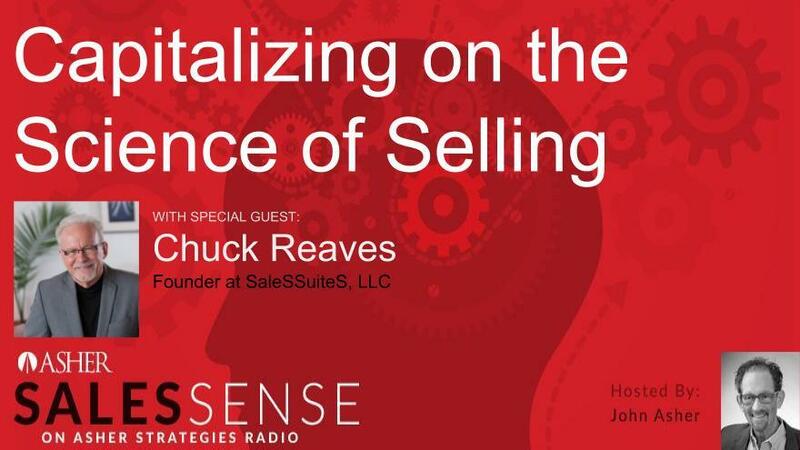 The April 4thAsher Sales Sense Podcast with host John Asher features guest Chuck Reaves in “Capitalizing on the Science of Selling.” Chuck is the Founder of Sales Suites and a top-rated corporate speaker. His first book, The Theory of 21, is the result of his years of success in the corporate environment. Chuck has proven his theory about accomplishing the impossible with astounding results by applying it to his life, and to the lives of others. His book, Never Take Money from A Stranger, teaches how to ask for whatever you want and get it. His latest book is The Nanosecond Salesperson; Like the One Minute Salesperson, Only Faster. As a consultant, Chuck has worked with large and small companies to assist them in achieving their impossible goals. He became the president of a 30-million-dollar bakery, made sales calls for a multi-billion dollar corporation, and even served as press secretary for a Congressional candidate. He believes in doing what it takes to accomplish his client's goals.